I've been out of the industry the last couple years and haven't really been riding. I still have my old 2008 supersix with super record on it, but I sold my SISL SRM that I had. I noticed that in the last few years quite a few powermeter companies have popped up as well as a couple of cranks that have gotten in the weight category of the SISL's. What is going to be the lightest option out there? Only real requirements are that it be BB30 and work with campy 11 speed. SRM still rules, in my book. 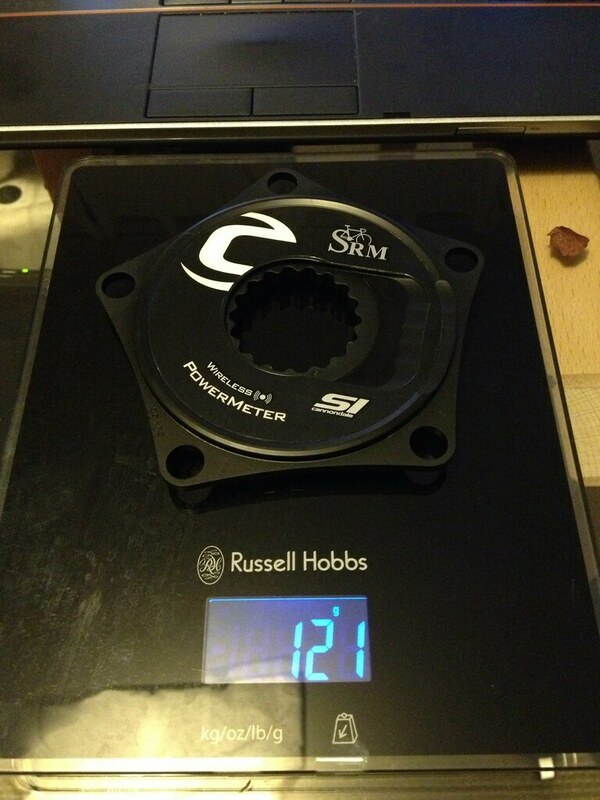 You can get the SRM Si with 135mm rings, too, if you want to run Record rings. unless someone can prove otherwise, i believe that the hollowgram and specialized cranksets are the lightest out there for bb30. i happen to have specialized cranks in a few lengths, as well as hollowgram SiSL *and* SiSL2 setups. i have power meters for both, though the cannondale setup is for MTB. i was very curious about the claims of hollowgrams being the lightest crank out there. i believe the specialized setup is actually lighter, and here is why: the specialized arms INclude the spindle (each arm contains 1/2 the spindle). most weights for hollowgrams that i have seen reported seem to EXclude the spindle -- or they compare without standardizing the chainrings. a set of specialized arms in 172.5 comes in at 330g. hollowgram SiSL2 arms in 172.5 weigh in at 260g. one needs to add in the spindle, washers and the crank arm bolts -- i believe that will total about 130g. i've left off chainrings and bolts, as well as spider and lock rings for that comparison. the specialized SRM comes in at 118 (compact) or 169 (standard). the standard has only one battery (thus shorter life) whereas the standard has 2.
for comparison, a compact specialized quarq is 134g and the standard is 151g. i can't compare the quarq or srm cannondale road power meter, and it's not a good comparison to share the srm cannondale mtb meter weight. if you add this up it suggests to me that for a standard setup, specialized arms + quarq (+ whatever rings you want to run that are light enough to meet your standard but still strong enough to produce accurate power readings) would be the lightest bb30 combo. for compact, specialized + srm is a bit lighter. on the other hand, the srm is a bit less sensitive to ring selection, so in theory you might be able to run lighter rings and still get a good calibration that you might not be able to do with quarq -- so it might wind up being lighter for both compact AND standard. 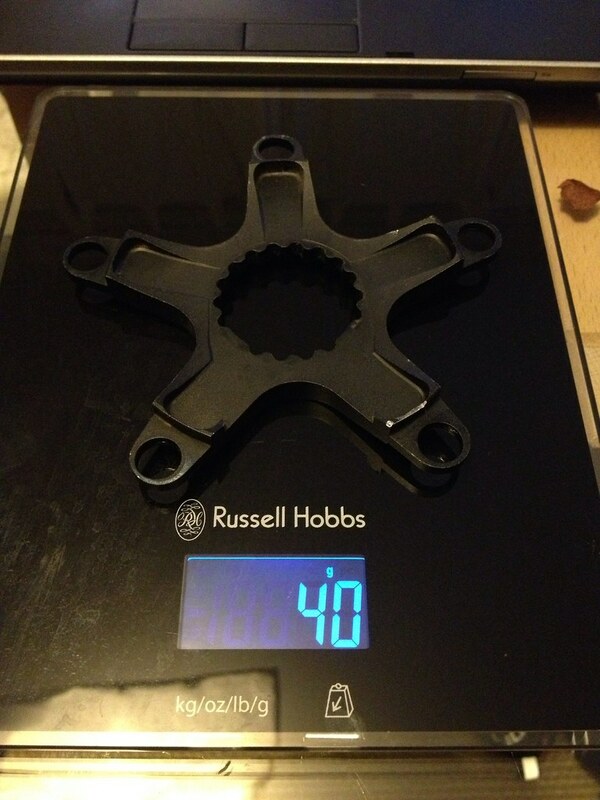 For reference, my Rotor 3D+ cranks (which include the spindle) are 451g, my 110BCD Power2Max is 228g. Not the lightest by any means, but they have other merits. Anyone have "real world" weights? 170mm SiSL 110BCD SRM w/o rings or BB bearings, but including spindle and bolts is 503g. My mate bought the new gen Quarq and paired it with the Spec arms and I believe it came in ~10g less than my HG setup when normalized for rings. Edit: Adjusted the weight after someone posted rings plus the Rotor came to 660g. Made me doubt my notes so I looked at the pics and sure enough I was wrong. Sorry, I normally don't subtract the BB or Rings. Last edited by Stalkan on Mon Feb 11, 2013 12:41 pm, edited 1 time in total. Privateer wrote: For reference, my Rotor 3D+ cranks (which include the spindle) are 451g, my 110BCD Power2Max is 228g. How was it dealing with them? I was looking into them, but was slightly put off being outside the US and having to deal with and issues that came up. 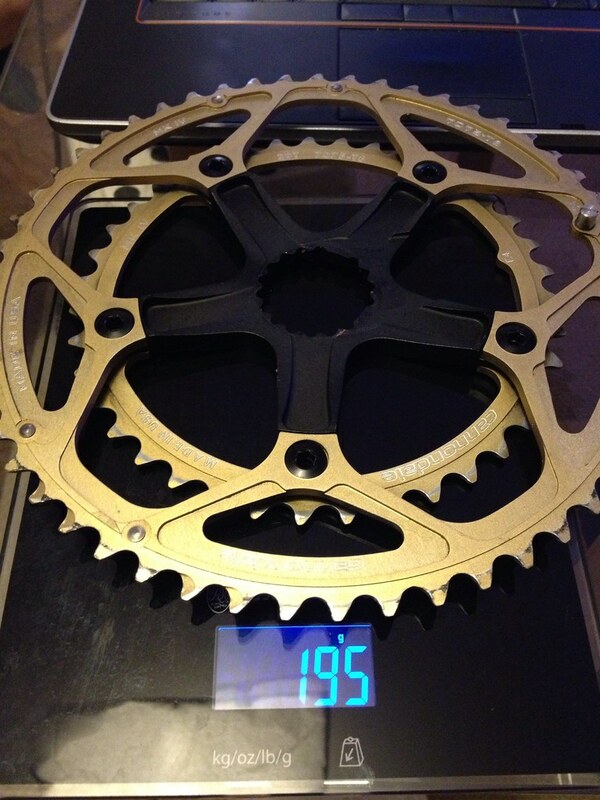 THM m3 SRM cranks are around 700g with bb. And look 1000% nicer than (any thing )specialized (has ever made ) cranks and subjectively nicer than SiSL cranks. tetonrider's numbers are about right for my 110BCD specialized setup. My recollection is 550g for the 172.5 arms, 110BCD carbon spider, and praxis rings. Adding the Specialized Quarq speedzone spider added ~90g, ending up at ~640g for the crank assembly sans bottom bracket. The new quarq spider is supposedly better at supporting different rings (advertised as omnical). 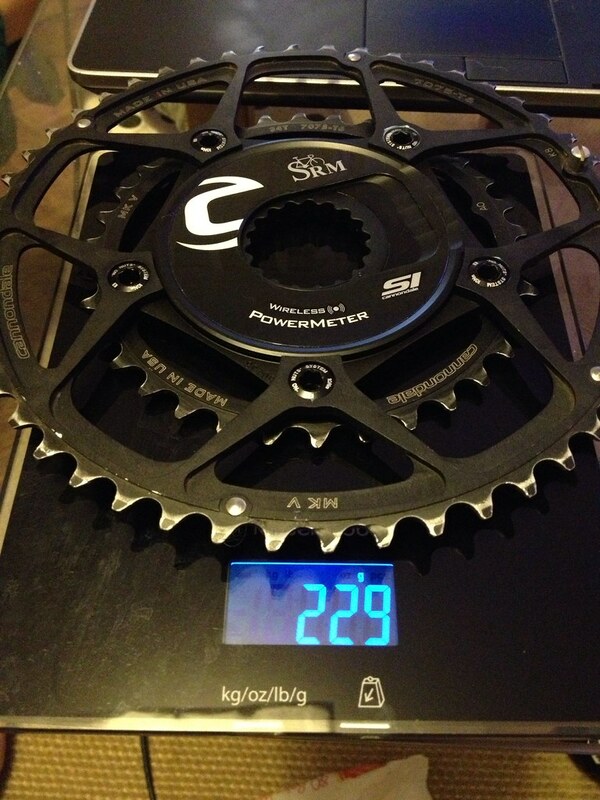 Looks like the SRM would have been 15-20g lighter, for roughly $1000 more, and a non user replaceable battery. They were great. Responsive to emails, shipped quickly... can't fault them. Admittedly the last two are a 53/39 compared to a 50/34. Will I have any issues with the rotor cranks running campy? I've also been looking at the sram red quarq, but they seem to be even more picky with their setup, only a full drivetrain through them will work. Can the new red crank work with campy 11sp too? I've been using Rotor Q-rings with Campy 10 speed for a few years now. It works really well, but you will need to spend some time setting up the front derailleur... it's a bit sensitive to both yaw and height to get it to shift crisp and without risking dropping the chain. How about the new sram bb30 quarq? I have owned both the cannondale and SRAM SRM's however and I would definitely say the Cdale SRM was my favorite of them all and certainly light.